Ordering is simple. First, select your garments from our wide variety of available sources on the Garment Catalogs page. Call or e-mail us with the style number, size, color and quantity. Next, send us your artwork via e-mail to ensure we get all the information we need. Once we have your garment selection and artwork we will provide you an itemized quote along with artwork proofs for you to review ensuring accuracy. When ready, give us the 'go ahead' and we will complete and ship your order as quickly as possible. We charge you the actual cost of shipping. For small orders we use US Priority Mail and for larger orders we use UPS Ground. Expedite delivery is available if requested. Orders totaling $500 or more get ground shipping for free! Will my design be saved for future use? Yes, we save designs for a period of 3 years from the time last used. However, we are not responsible for lost artwork due to computer failure after 90 days from last use. Lost artwork within 90 days due to computer failure will be re-digitized at no cost. We offer discounts on orders of any single garment style in excess of 12 items: 13-36 items (10% off), 37-72 items (20% off), 73-144 items (30% off). Please call us for orders greater than 144 items per style so we can quote you the best available price. Do these discounts also apply to embroidery and printing? No. Embroidery and printing has unique pricing based on quantity. Do these discounts apply if I order a variety of sizes and colors? Absolutely. As long as the number of garments are all a single style. I'm in a rush. Can I speed up the order? Give us a call. We try to complete all orders as quickly as possible but can expedite mail transit times at an additional cost. What is the typical timeframe for orders to be completed? From the time the artwork is approved we try to complete all orders within two weeks. This time may be extended for digitizing, out of stocks or other product delays though we will keep you informed and provide updates as necessary. Will the personal information I provide be sold or given to other companies? Absolutely not. We use your information only to provide better customer service and ordering convenience. Can I order a sample garment? Absolutely. In fact we encourage it. We want you to know exactly what you are ordering so there are no surprises when you receive your final order. The sample may either be included in the cost of your order or returned to us at no additional fee. The garments I purchased are not what I expected. What do I do? We try to provide as much information as possible including sample garments and artwork proofs so you can make an informed purchase. If the garments have been embellished they are not returnable unless defective. Are your garments 'true to size'? Not necessarily. We offer a wide selection of apparel by several different manufacturers and their sizing is all slightly different. Our Sizing Guide is to be used as a general reference. 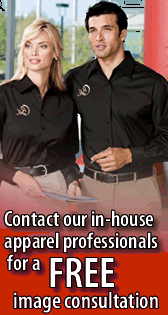 If you are unsure about a size, you can order a sample garment to try before it is embellished. What is the difference between pique and jersey? We have a complete glossary of garment terms available to use as a reference. Don't hesitate to call or write for help in selecting an appropriate garment. Can I send you my apparel to have embellished? No. If one of our machines were to malfunction and damage your garment we could not replace it. If you need a specific style give us the details and we will do our best to match your garment through our sources. Digitizing is expensive! Why does it cost so much? Digitizing is time consuming and requires using several expensive computer programs used by experienced personnel. Many times the cost of digitizing is more than what we pass on to the customer. Can you apply logos from other companies? No, those logos are copy write and belong to those companies. We will only apply logos with written permission from the owner. What about Mickey Mouse? Can you embroider him on my daughter's jacket? No, Mickey Mouse is a copy write image belonging to Disney. Will any design fit on baseball caps? The maximum area for a cap is roughly 2x4 inches, or about the size of a business card. If your design does not fit we may be able to modify the image to fit within the available area. Yes, we assign your design a specific style number and save along with your personal information. By entering the style number in the search box of the website you can review your artwork information including size, colors and stitch count.